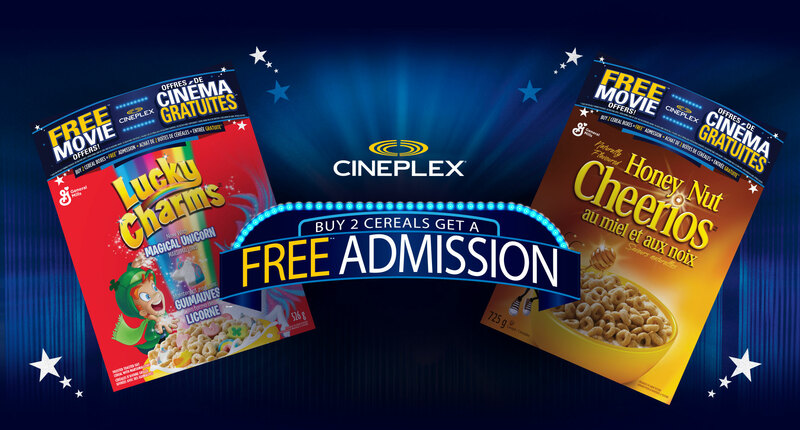 Enter your unique coupon code and email information in the form below to receive your Cineplex Movie Offer from General Mills. 1 unique coupon code = Buy One, Get One Free Admission (Adult or Child). Valid for Showtimes Sunday – Thursday. One time use only. Adult and Child codes are separate and cannot be combined. What is the General Mills Offer? And how does it work? There are two (2) offers available for you to choose from. Both offers are valid from March 3, 2019 until June 30, 2019. Offer #1: Buy one or more boxes of specially marked General Mills cereal and you will receive an offer code inside the box that can be redeemed for a Buy One, Get One Free General Admission offer (Adult or Child). Go to Cineplex.com/FreeMovieOffer and fill out the form with the 1 code you are provided. You will receive an email from Cineplex with a promotional code valid for your Free General Admission offer (Adult or Child). Offer #2: Buy two (2) boxes of specially marked General Mills cereal and you will receive two (2) offer codes (one in each box) that can be redeemed for a Free General Admission offer (Adult or Child). Go to Cineplex.com/FreeMovieOffer and fill out the form with the code you are provided. You will receive an email from Cineplex with a promotional code valid for your Free General Admission offer (Adult or Child). What products are participating in this promotion? Specially marked General Mills cereal products. My cereal box is showing the Cineplex promotion, but did not have a promotional code, what can I do? You can reach General Mills Consumer Relations by toll-free telephone, at 1-800-516-7780 or by using the Feedback form on their website www.lifemadedelicious.ca. Their hours of operation are Monday to Friday, from 9 am to 7 pm, Eastern Standard Time. When will this offer expire? My code is expired, what should I do? Unfortunately, your code is no longer useable. Can I upgrade my purchase for a premium show? If so, is there a surcharge? Yes, admission coupons are redeemable for premium experiences with the payment of the applicable surcharge for the following: IMAX®, UltraAVX®, UltraAVX®3D, VIP (19+) admission, Digital 3D presentations or 4DX or DBox seating. Offer is not valid for Midnight Showings. Do I earn SCENE points when redeeming this voucher? If so, how many? SCENE points are only earned on paid admission tickets. Free admission will not earn you SCENE points. Can this code be used on a Tuesday with discounted admission rates? Can I redeem my SCENE points with this offer? If so, how many? SCENE points may be used towards paid admits. The number of points required to get a ticket depends on what type of show you’re choosing to watch (general vs premium). Can I redeem this for advanced shows? Yes, as long as the showtime selected is before the expiry date of the promotion. How do I find showtimes? Visit Cineplex.com and select the theatre you want to visit. My code is damaged/lost, what can I do now? Please contact our Guest Services team here. I never received my confirmation email and tickets, whom do I contact to find out where it is? Our Guest Services team would be happy to help! This unique voucher code is †† VALID ONLINE ONLY at www.Cineplex.com/freemovieoffer for one (1) Free General Admission ticket (Adult or Child) when used with another unique voucher code or one (1) Buy 1 Get 1 (BOGO) General Admission ticket, from March 3 – June 30, 2019. Voucher code must be used by June 30, 2019. Adult or Child FREE and BOGO General Admission offer applicable towards the purchase of a General, Senior or Child Admission ticket at equal or lesser value. VALID FOR SHOWTIMES Sunday through Thursday (inclusive) only. Not valid for Midnight Showings. An applicable surcharge per paid and/or free tickets will apply for IMAX®, UltraAVX®, UltraAVX®3D, VIP (19+) admission, Digital 3D presentations or 4DX or DBox seating. Cannot be combined with any other promotion, coupon, voucher or special discount offer or redeemed for non-feature film screenings and Cineplex® Events presentations. BOGO General Admission tickets are valid for same day and same performance only. SCENE® points are not issued on free admission tickets. Paid admission tickets earn SCENE points as per standard earning terms. TICKETS ARE NON-REFUNDABLE. Offers cannot be redeemable for cash and are not valid for re-sale. NO TIME EXTENSIONS ARE ALLOWED. CONFIRM YOUR ORDER BEFORE PURCHASE. ONLINE TRANSACTIONS ARE NON-REFUNDABLE. ADDITIONAL RESTRICTIONS MAY APPLY. NO SUBSTITUTIONS.